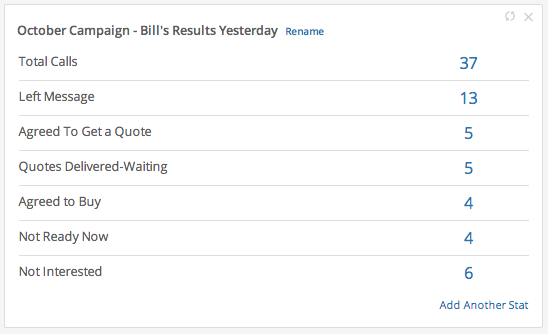 With turboDial, you can use standard Infusionsoft report generation tools to track your phone calling campaigns. turboDial automatically attaches a Call Note to the contact record after each outbound call. Those turboDial Notes provide all the data you need to build your reports. Reports are created in the Infusionsoft->Admin->Reports section of your account. And the Report type to use is “Task Note Report”. Each of the phone call stats you display on your dashboard will be based on a Task Note Report that you have saved. And note there is a single blank space between the : and the C .
See more information on creating dashboard reports for Inbound calls on this page. You can find more examples of note record titles at this page. How to generate turboDial Task Note reports filtering on Users, Date or Interval, and Call Outcomes. How to include turboDial statistical summaries in the Infusionsoft Dashboard. The reporting methods described above are designed to report on calls that are completed, that is, calls that are answered by a human or by a machine. Reports that focus on completed calls are less prone to “gaming” where a calling agent initiates many calls for the sole purpose of making their work effort look greater than it really is. However, if you also want a report based on calls that are attempted, that is, calls that are dialed without regard to whether they are answered, then please refer to the techniques described on the What About Unanswered Calls page.